... We're Glad you stopped by..... In today's maze of search engines, links, and keywords, we try to be the company in the log home industry that is down-to earth. We hope that you like what you see here. 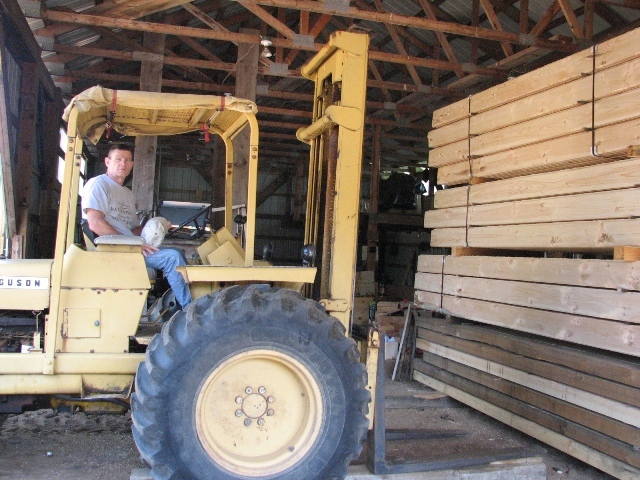 We manufacture a few different log styles and sizes, along with log siding and ceiling beams. We are currently producing about 25 different wall log profiles. We sometimes have some extra D-style wall logs on hand, enough supply of logs to build the main 8' perimeter walls for a 30x50 ranch home. These are 7.5" x 7.5" white pine, and have a triple T&G weather seal. This is a lineal kit, meaning you will be cutting the logs to the lengths you want for your building. We can sell all or part of this package, or include it in a larger package of logs. We also can supply log ceiling beams and 4x8 timber beams that can be added to the package if you are putting up a two-story or a loft cabin. Price of the 30x50 ranch is $16,600, shipping will add somewhat, and you must also pay the sales tax if it's a New York purchase. If we don't have these on hand, we can get them produced. Call if interested, at 315-529-0987. Our Objective is to provide a good selection of good quality Log Homes. We manufacture log homes. West Adirondack has produced log cabins and supplied log home kits for approx. 35 years. If you're interested in a year-round custom log home, a summer vacation home in the mountains, a hunting camp or fishing camp on the lake, or a large commercial log building such as a ski lodge or log motel, we've probably done it. We produce cabin logs with a Triple Tongue-in-Groove weather seal, the log wall equivalent of triple pane windows. Our logs are available in two standard heights, and on occasion we will manufacture special sizes for customers. Our 5.5" wide cabin logs are a good choice for hunting camps and garages, and the 7.5" x 7.5" log packages are a nice size for year-round residences. Our larger logs, the 7.5" high x 9.25"+ wide log kits, are good for the ski lodges and commercial log buildings, structures that are large enough to warrant the bigger log look. With the different height wall logs, there is also a choice of either the D style log exterior, or the hand hewn ( hand peeled log ) exterior. There is also a variety of available widths with each height. In addition to these choices, the interior log surfaces can be produced with either a smooth, flat surface with V-notched joints, or in the round D style, same as the D style exterior. We've even produced wall logs where the exteriors were left rough sawn. With these options, we manufacture about 25 different wall log profiles to choose from for your log structure. West Adirondack Log Home Company, Inc. is located in the town of Parish, N.Y. We are north of Syracuse, about a half-hour's drive from Lake Ontario, and an hour and a half south of the Canadian border at the Thousand Islands bridge. Our logs are manufactured in a 7.5" high finished profile. Our machinery produces logs in D-style exteriors, with or without a drip edge to it. We can also produce wall logs with a rough cut look on the exterior, and a D-style interior as well. We use eastern white pine for our D-style log, because it is large enough in diameter to saw out the 8x8's and 8x10's for the raw material. West Adirondack also produces log siding packages for entire houses, in the D-style exterior. These packages are also ship lapped for better weatherproofing. Our log siding is the 7.5" high size. Some are with drip-edge, and some are without. You can view pictures of our siding on this website. Our 48-page color catalog is an informative introduction to the industry, and along with some floor plans/models, we try to provide insights into the log drying processes (air-drying vs. kiln-drying), shipping charges, wood preservatives, weather seals, and some real advantages to purchasing lineal packages instead of precut packages. It's $7 if you're interested, and you can order one from this website. "Thanks for checking in !!!"